Rooms are available at the Hyatt Regency Washington on Capitol Hill. The Hyatt Regency Washington on Capitol Hill is within walking distance to the conference location, Georgetown Law, located at 600 New Jersey Ave. NW, Washington, DC 20001. The Georgetown Law campus is located in the heart of Washington, DC at 600 New Jersey Ave. NW, Washington, D.C. Please note: Georgetown Law is not located at the main undergraduate campus. The opening reception and dinner on the evening of November 29, 2010, will be at the Corcoran Gallery of Art, located at 500 Seventeenth Street NW, Washington, DC 20006. The Corcoran is a 5-minute cab ride from the Hyatt Regency Washington. The Georgetown Law campus is located in the heart of Washington, DC at 600 New Jersey Ave. NW, Washington, DC. Georgetown Law is easily accessible by Metro, the subway system of the Washington area. Take the Red Line to Union Station and exit onto Massachusetts Avenue. Turn right on Massachusetts Avenue and walk two blocks to the corner of Massachusetts Avenue and New Jersey Avenue. Turn left on New Jersey Avenue. Georgetown Law will be on your right. You may also take the Metro to Judiciary Square and walk two blocks on E Street to 2nd Street. Follow I-95 South. At the I-495 Junction, follow the signs toward 95 South to Richmond. **Take the Baltimore-Washington Parkway/ I-295 exit (west). Take the Baltimore-Washington Parkway to US 50 (New York Avenue). Follow 50 heading west into Washington, DC. Make a left onto North Capitol Street, and then make a right onto Massachusetts Avenue. Before the next light, make a left on New Jersey Avenue, and immediately bear right on First Street. The main Law Center building, McDonough Hall, will be on your right. Follow I-95 North. At the I-495 junction, 95 will turn into 395. Follow 395 North to Washington, DC. Cross the 14th Street bridge and keep to the right. Continue following signs for 395 North and take the D Street/ US Senate exit. Continue following the signs for 395 North and continue into the D street tunnel (stay in the far right lane). In the tunnel, take the D Street exit and make a right at the first traffic light. 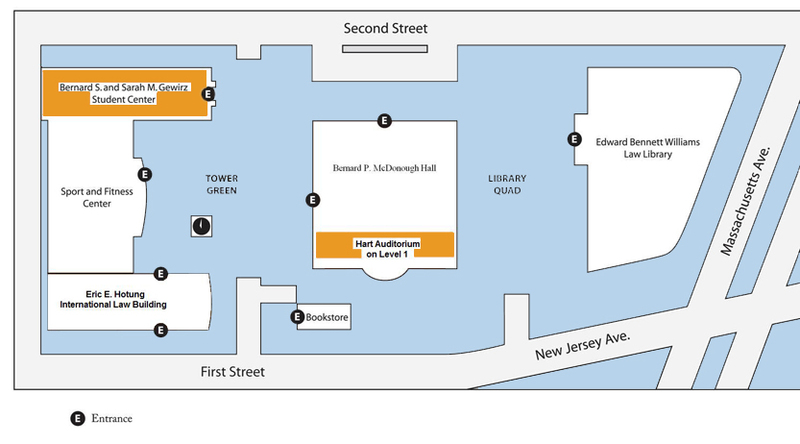 Turn left onto New Jersey Avenue, and the Law Center will be on your left-hand side. Follow US 50 West into Washington. Make a left onto North Capitol Street, and then make a right onto Massachusetts Avenue. Before the next light, make a left on New Jersey Avenue, and immediately bear right on First Street. The main Law Center building, McDonough Hall, will be on your right. Parking is very limited around Georgetown Law. There is a parking garage across the street at 601 New Jersey Avenue NW, and the parking is $13 per day. There is also limited metered parking available for $.25 per 20 minutes (in quarters only). Take the train to Washington, DC's Union Station, and then follow the Metro directions above. Washington Reagan National Airport is the closest and most convenient airport, as it is only 6 miles from the Law Center. Transportation to the Law Center from National Airport is available by taxi or Metro. By taxi, travel time to the Law Center is about 15 minutes, and the fare is approximately $15.00. Be sure to tell the driver that you are going to the Law Center, NOT the main undergraduate campus. By Metro, allow approximately 30 minutes. The fare is $1.60 during rush hour (5:30-9:30 a.m., 3-8 p.m. Monday-Friday), and $1.20 during non-rush hours. The Metro station is located across the street from the main terminal at National Airport. Take the Yellow Line to Gallery Place. When you arrive at Gallery Place, transfer to the Red Line (in the direction of Glenmont) and get off at Union Station and exit onto Massachusetts Avenue. Turn right on Massachusetts Avenue and walk two blocks to the corner of Massachusetts Avenue and New Jersey Avenue. Turn left on New Jersey Avenue. Georgetown Law will be on your right. You may also take the Metro to Judiciary Square and walk two blocks on E Street to 2nd Street. A taxi from BWI will cost approximately $50.00; however, you can take a shuttle bus from the airport to the MARC train station. The ride to Union Station will cost $5.00. For more information, please visit the Maryland Transportation website or the BWI website. A taxi from Washington Dulles to the Law Center will also cost about $50.00; however, you can take the Washington Flyer bus for $8.00 to the West Falls Church Metro Station. Take the Orange Line (toward New Carrollton) and transfer at Metro Center to the Red Line (toward Glenmont). Exit the Red Line at Union Station and exit onto Massachusetts Avenue. Turn right on Massachusetts Avenue and walk two blocks to the corner of Massachusetts Avenue and New Jersey Avenue. Turn left on New Jersey Avenue. Georgetown Law will be on your right. You may also take the Metro to Judiciary Square and walk two blocks on E Street to 2nd Street. For more information, visit the Washington Flyer website.